While still a fun read, the complexities, the clever dialogue and the most intriguing aspects of the first story were, sadly missing in this installment. I was hoping for more of the skill that Carriger brings to her adult-themed stories, with their clear pathway and well-developed characters. As in the first book (Etiquette & Espionage) the characters are all fairly middle of the road, what started with some promise has fallen flat with some strange point of view changes that are quite jarring. From limited 3rd person to omniscient, too many he said, she said, and several lengthy passages were we are being told rather than shown the action and events, the story read quickly, but that was it. I was reading along, dragged hither and thither without any real need for input or imagination. Sophrenia is just as adorable here, with her occasional flashes of insight and humor, but there are far too many moments of dialogue that are simply there, without real purpose but to check in on the multitude of characters and their difficulties until they come into Sophrenia’s circle. Sadly, I see this happen often. Authors who are clever and well-received in their more adult-themed stories tend to simplify their plots and characters to appeal to a younger audience. Unfortunately, children and teens are far more capable of understanding and recognizing complexity in stories, and they are craving something MORE in their books and films. It isn’t always about a romance and the language or sexual content – several would do well to recognize that some things: acceptance, finding your place, making friends, discovering and uncovering answers to mysteries appear to us all – no matter what age. 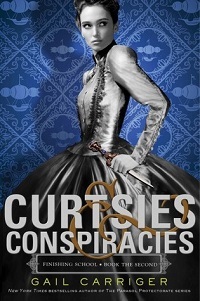 There is still some of the clever word-play and unique names, and Carriger has brought the action and story forward for a predictable but undoubtedly amusing conclusion, but the multitude of conspiracies, red herrings and sometimes outright unneeded character involvement. A fun read, but in a passive and pass the time sort of way, sadly I don’t believe I will continue with this series.